Pomme Koch places the crown atop the head of Zach Appelman. Photo by Teresa Wood. 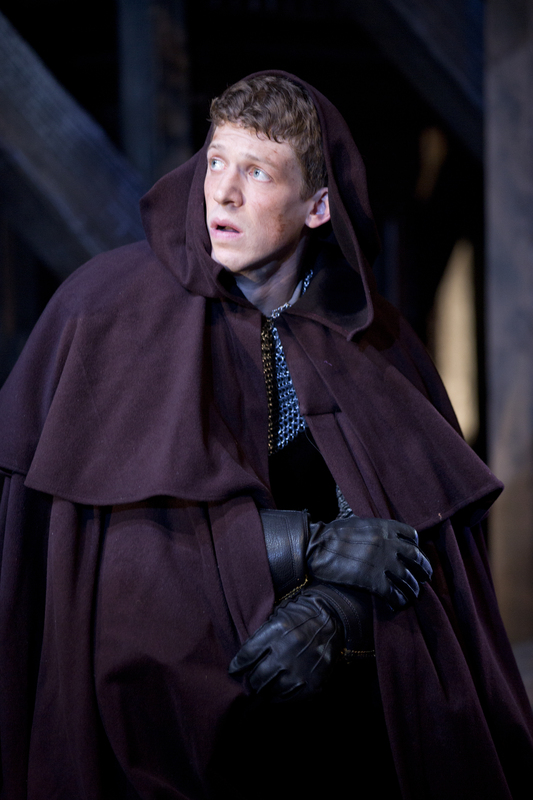 Continuing in our series of Henry V cast interviews, today we bring you Zach Appelman, who plays the young King Henry. Not only does this mark Zach’s Folger debut, but his DC theater debut as well. And the city’s critics have responded, giving his multi-layered performance as Henry V unanimous praise. Just read The Washington Post review of the production here to give you an idea. Zach appeared on the Broadway stage in the critically-acclaimed War Horse, and has appeared on television’s Homeland as well. He also makes his screen debut opposite Daniel Radcliffe in Kill Your Darlings, coming out later this year. We asked Zach a few questions about playing Henry, the production here (staged by Robert Richmond), and what he thinks of the DC theater scene. We hope you enjoy. Folger: What preparation did you do in order to play King Henry? Zach: I did a great deal of research, and read a number of books about that period in English history and the real King Henry. It’s incredibly useful to have a clear sense of the world in which the character lives. It informs you when working though some of the basic questions about the character. Who is he? What was his life like while growing up? What was his education like? With Shakespeare, however, the research only takes you so far. The real foundation of the performance, for me, lies in the text. There is so much invaluable information in the language and the verse. Shakespeare truly writes “character” into his verse…what words they choose, how they uniquely formulate thoughts, what images they cling to. If you look at three of Shakespeare’s kings, say Henry V, Richard II, and Richard III, you will find three very distinct linguistic styles…different vocabularies…different minds. It’s really astonishing. So I used this as my starting point. Long before rehearsals even begin, most days I am hunched over a table at a tiny coffee shop in Brooklyn, reading and re-reading the text, defining and re-defining each and every word, and meticulously feeling out the rhythm of the iambic pentameter. It’s painstakingly detailed detective work, and for me it’s one of the most exciting parts of the job! King Henry (Zach Appelman) goes incognito. Photo by Scott Suchman. Folger: What specifically draws you to the play Henry V? What is unique and special about this particular play? 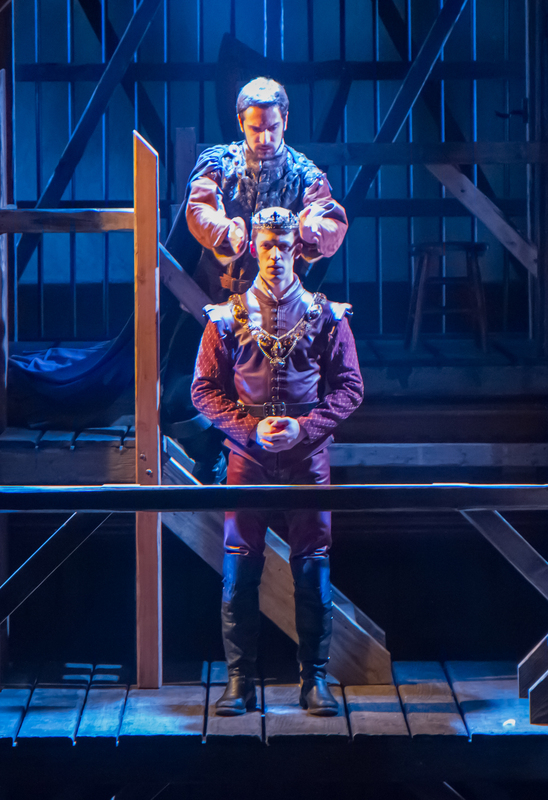 Zach: Henry V is often thought of as a “war” play, but it so much more than that. It is a fascinating exploration of humanity. Henry is one of Shakespeare’s most accessible kings, in that an audience can really identify with him. He wasn’t born into royalty, but rather it was thrust upon him unexpectedly as a teenager after his father seized the crown. The fate and responsibility of an entire nation is dumped upon the shoulders of this young man….a young man who never wanted that burden in the first place. What an extraordinary position to be in! It’s a fascinating lens through which to explore leadership, responsibility, and the human cost of war. It’s a coming of age tale in a way, and something we can all relate to. Folger: What is your favorite moment that takes place on stage in Henry V? Zach: My favorite moments are when the audience is really responding to Shakespeare’s language. There is a moment right after intermission where the Chorus (played by the marvelous Richard Sheridan Willis) speaks directly to the audience, setting the scene of the night before the battle. It is a quiet moment, almost whispered as he paints a picture for the audience of the French and English soldiers huddled in their tents. In the final line of the speech, with simple, but powerful words, he describes King Henry walking through the camp to comfort his soldiers…In performance, this beautiful line is consistently met with an audible gasp or sigh from the audience. Beautiful words, spoken so simply and with such clarity, that they make the audience gasp. The power of Shakespeare’s words becomes so palpable. It doesn’t get any better than that. 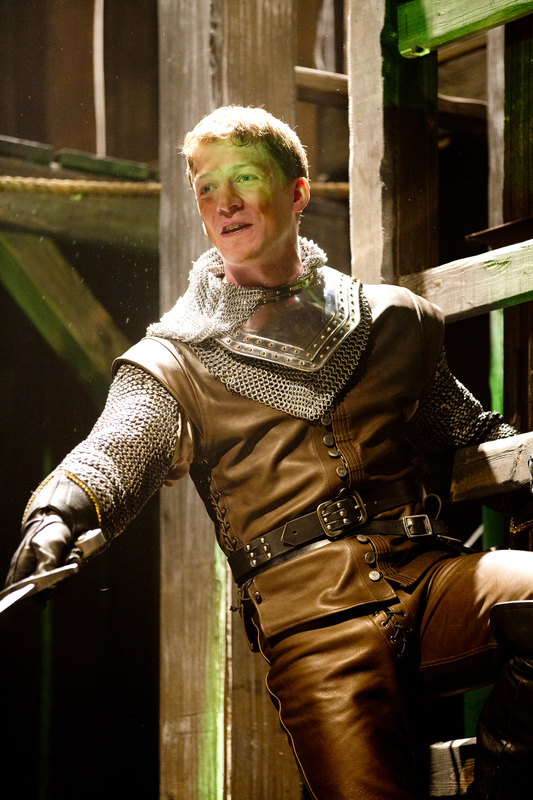 Henry (Zach Appelman) in the middle of trying to woo Princess Katherine. Photo by Scott Suchman. Folger: What is your favorite Shakespeare play – and (briefly) why? Zach: I’m really partial to the Henriad, Shakespeare’s second tetralogy of history plays beginning with Richard II, though both parts of Henry IV, and climaxing with Henry V. I imagine Elizabethan audiences followed these stories like modern audiences follow sagas like Game of Thrones, or The Lord of the Rings. The stories told in these plays are epic and riveting, and you become very emotionally attached to the fates of these characters. The plays are suspenseful, incredibly funny, deeply moving, and stuffed full of some of the most delicious language ever written. Folger: You are new to the DC theater scene. Tell our readers, if you will, something about Zach Appelman, the actor. How would you describe yourself? 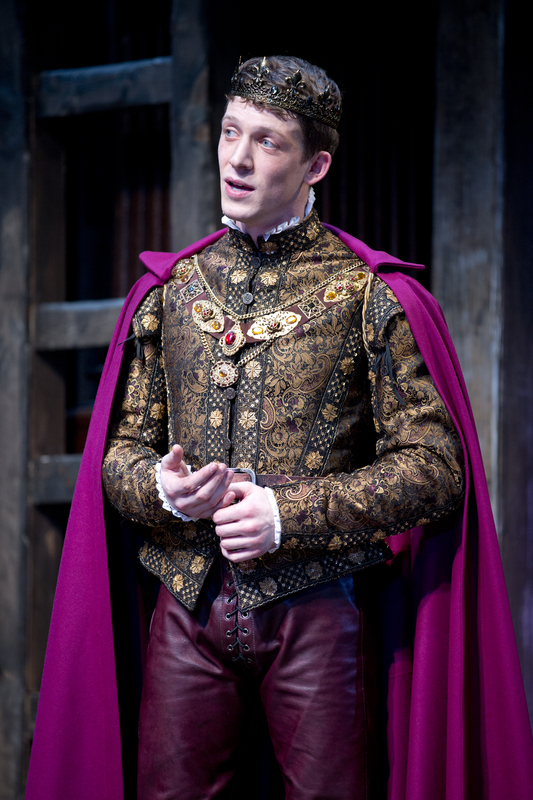 “Once more unto the breach, dear friends!” Zach Appelman as King Henry. Photo by Scott Suchman. Zach: The DC theater community has been so wonderful.The audiences especially are fantastic. A few weeks ago, a family came with their two small children to see Henry V, and they were waiting in the lobby after the show. The young boy (about 8 years old) shyly approached me and said he wanted to give me something. Excited beyond belief to see the play, he had brought a tennis ball with him to give King Henry after the show. He handed it to me sheepishly, grinning from ear to ear. It was perhaps the sweetest gift I’ve ever received, and a fantastic welcome to the DC scene. It’s sitting in my dressing room as we speak. Folger: What would you like people to take away from this performance as they leave the theater? Zach: For audience members unfamiliar with the history plays, I hope they leave the theater with a new interest in them. For those who know Henry V quite well, I hope our productions sheds new light on certain aspects of the play, and challenges some of their preconceived notions. And with that, the countdown has begun — only 10 days left to see Henry V on the Folger stage before it closes on March 10. There are limited seats still available, so call 202.544.7077 if you’d like to join us. Also, make sure to pick up a copy of The Washington Post this Sunday (3/3) for a wonderful feature article on Zach Appelman playing the young king. Thanks to Zach for taking the time to answer a few questions for us. We hope to see you at the theater!